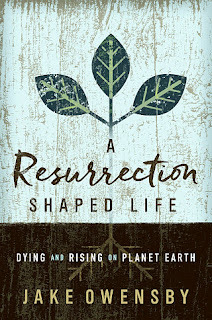 I received a copy of Jake Owensby's new book A Resurrection Shaped Life: Dying and Rising on Planet Earth to read and review. Owensby is the fourth Bishop of the Episcopal Church in Western Louisiana, author of several books, and regular blogger. I wasn't sure what to expect going in - I've never read anything else Owensby has written, but the title and theme intrigued me. This is a short read, just over 100 pages. Chapters include themes like "Growing Beyond Our Past," "The Meaning of Suffering," "Mending Loss and Sorrow," and "Just Us." I think resurrection is sometimes a hard 'concept' for both seekers in spirituality and for long-time disciples to grasp. We want to believe in resurrection, but we have a hard time finding evidence of it in our own lives. Even perhaps believing in the resurrection of Jesus is easier than believing in our own resurrected lives, because we can keep Jesus' resurrection at a safe distance on the pages of scripture, but we can't help but notice that our own lives seem remarkable not full of new life. I think Owensby does a really remarkable job of bringing resurrection close to us, and helping us understand what resurrection looks like in the here and now. There are brief sets of study guide questions at the end of each chapter for personal or group use. I definitely recommend giving this book a read!